"More than just an album, "Alawn" is a real emotional journey that the listener will appropriate as he listens attentively and repeatedly." In Old Welsh, "Alawn" means Harmony, the one towards which every person who faces the trials of life and the torments of his soul ultimately tends. With certainly a good part of autobiography in the concept deployed throughout the eight tracks presented here, Dam Kat - the soul of Children in Paradise - offers us a very personal first album in his own name, even if his usual friends are never very far away. "Courage and Sorrow" begins the journey with an Irish flute melody played by Loïc Bléjean, creating an atmosphere that will remind us of the late band The Violet Hour. 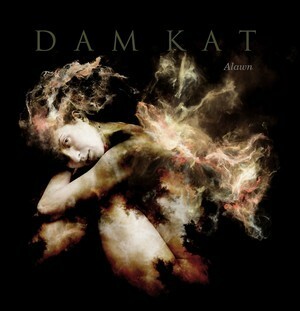 Dam Kat's suave voice then settles on a background of floating keyboards with disturbing choirs that will gradually take power until the end introduced by Loïc Bléjean's Uillean Pipes which allows a previously contained fury to free itself, supported by the metallic guitar of the inevitable Gwalchmei. Darker than the usual universe of Children in Paradise, this first slap is followed by the album's most striking title, the one that sees our Dam Kat go to other shores. The Devil Inside Me' is indeed quite Dantean, with its disturbing keyboards, its guitar, its metal guitar and above all a Dam Kat who goes so far as to eruct, scream, growl lyrics that we can guess very loud. Emotions guaranteed. And if the beautiful will return later to more conventional interpretations, the whole album takes us into this musically bipolar universe in which vocal softness and floating keyboards mix with the fury of the raging elements delivered by Maestro Gwalchmei's guitar, all based on mid-tempo rhythms that allow us to make an even greater impact on the subject. The other striking example of this assumed dichotomy is carried by'I Write a Poem' where, after a magnificent and soothing Celtic appetizer, the song unfolds its harmonies in the manner of Elizabeth Frazer (Cocteau Twins) on a sharp guitar background. The mastering of all this, entrusted to a certain Daniel Cardoso (Ana-Thema), also allows us to fully enjoy these atmospheres where we also feel the influence of Tolkien's universes, and by closing our eyes we like to imagine the soundtrack of one or the other of his works brought to the screen. The resolution of the whole and the restored harmony are finally proposed by "I Believe", a gentle final title in which the scents of Mellotron combined with the Celtic Lyra bring a protective soothing effect, closing the book of torments and emotions. More than just an album, "Alawn" is a real emotional journey that the listener will appropriate as he listens attentively and repeatedly, with as far as I am concerned a spread over time allowing a certain maturation. But in the end for an exciting result! More than just an album, "Alawn" is a real emotional journey that the listener will appropriate as he listens attentively and repeatedly.